Well, You can't find me because now I am a full grown dam and a new mom! 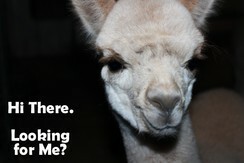 Aika as a cria -- cute as button! Rumaki has a sturdy frame with excellent bone density. His lustrous beige fiber is very fine, remaining less than 20 micron at age 2. He has uniform crimp, density, and excellent staple length. Rumaki is the complete package. Sire of our 8x champion Special K! We are bit chagrined that our listing of Aika shows only her cria pictures... Not to put them down, because she was cute as button then! But, her lack of promotion is purely our dereliction of our duties with no reflection on her qualities or worth. In fact, it might be a reflection of just how much we like this girl, since we were happy to keep her in our herd. So, MAYBE, just maybe, we will get 'better' pictures and let you have the opportunity to buy this dam or maybe we will keep letting her hide in plain 'sight' (pun intended). 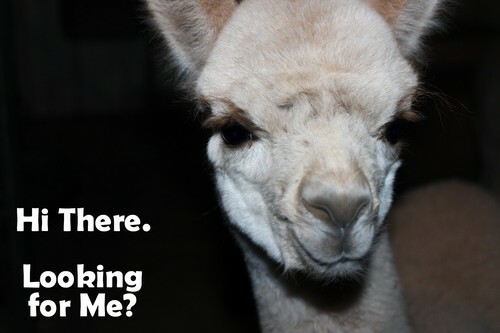 Seriously, in the meantime before we finally achieve an updated picture listing, if you have interest in Aika or her cria, let us know! We'd be happy to talk more about them. She was one of two dams we selected to breed to the many time champion, Matrix son Red Granite's Mr. Ben Franklin -- a beautiful male that won his share of banners in the brown male classes before going to stud in Oregon. 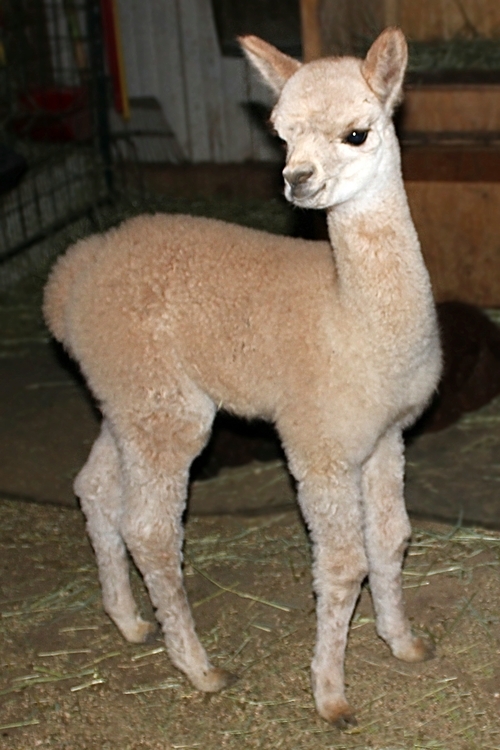 The 2017 cria produced from this pairing did not have his rich brown coloration, but she is not only spunky and cute as button like her dam was at the same age but also very shiny and soft -- showing good potential to carry her in the show ring. Her fiber staple length extended past our hand length and was crimpy all the way to her skin! After being shorn, we are really impressed with her regrowth of a beautifully shiny, crimp fiber that is a joy to touch. 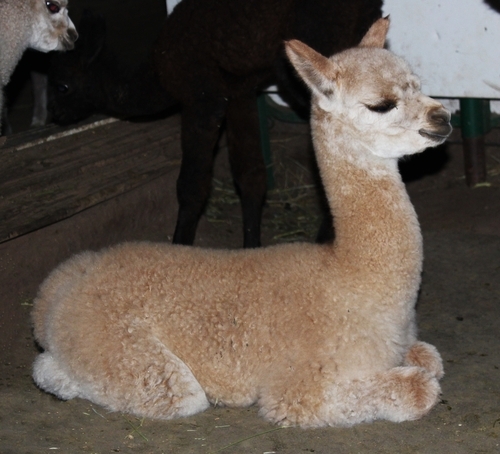 This year, Aika produced a stunning white male son by ACCOYO AMERICA SENECA WARRIOR! This Road Warrior son impressed us with his longevity in fineness and style. Aika is a great mom and this boy is beautifully covered with fiber qualities to promote. She comes with a breeding to any unrestricted herdsire for her next service sire. Aika is a 'love song' in Japanese, and it is pronounced 'AH-ee-ka' or if it is easier -- 'EYE-ka'.